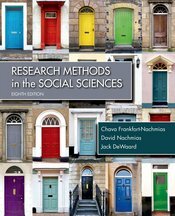 With its clear presentation and integration of detailed real-world examples, the acclaimed Research Methods in the Social Sciences accessibly illustrates the relevance of social sciences research without sacrificing key content. The eighth edition includes engaging new studies and examples that explore the use of Twitter feeds in social sciences research, the effect of climate change on human conflict, the use of rational intuition in explaining the Chelyabinsk meteor explosion, and much more. The eighth edition also includes new and expanded coverage of conducting qualitative research, as well as conducting research in our digital age, including the use of the Internet and various computer software packages for retrieving, cleaning, coding, and analyzing "big data."